Taiwanese President Tsai Ing-wen hailed the U.S. commitment to Taiwan under the Trump administration as “stronger than ever,” during at a recent livestream appearance at a Washington think tank. Tsai’s appearance at the Heritage Foundation on Wednesday was delivered via livestream from Hawaii — a point she underscored in her opening remarks. China staunchly opposes high-level visits between U.S. and Taiwanese officials, and last week had urged U.S. officials to block her visit to Hawaii. “I’m joining all of you from sunny Hawaii, which being at the center of the Indo-Pacific region, could not be an any more fitting location for the theme of today’s event,” she said. “She’s not trying to be conflictory with China, she is saying, ‘I am my own person, and I am the leader of this country,’ and I think that sends a strong signal. China should respect that,” he said. 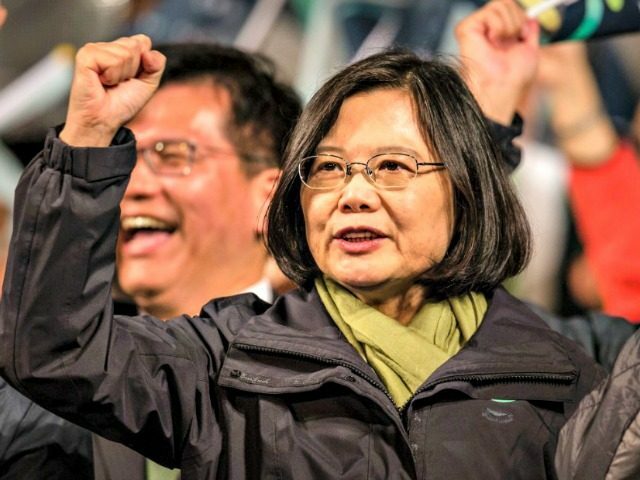 Tsai’s appearance marked the 40th anniversary of the Taiwan Relations Act, which the U.S. enacted in 1979 to maintain robust unofficial economic, political, and military relations with Taiwan, after it broke official ties in favor of a formal relationship with Beijing. Chinese nationalists fled to Taiwan after losing the war with Chinese communists in 1949 and established a new government which is today a thriving democracy. But Chinese President Xi Jinping has vowed to reunite the island with the Chinese mainland by 2030, which has prompted strong worry among U.S. officials and experts that China could seek to act militarily over the next decade. Under the Trump administration, the U.S. has stepped up its support to Taiwan verbally and materially, in the face of growing Chinese pressure to isolate the island diplomatically. Since the 2016 election of Tsai, whose political party is pro-independence from China, Beijing has undertaken a campaign to separate Taiwan from its remaining diplomatic allies and pressure American companies to recognize Taiwan as part of China. Beijing has also stepped up military intimidation of Taiwan, conducting more frequent and larger military exercises closer and closer to Taiwan. Bonnie Glaser, director of the China Power Project at the Center for Strategic and International Studies, told CNN China has not undertaken such a flight in 20 years, by some accounts. She said Taiwan has sought to maintain the status quo in regards to the relationship between China and Taiwan, but China “has used every opportunity to alter the status quo,” highlighting the need for Taiwan to take defensive measures. She said Taiwan is increasing its defense budget for the third consecutive year for the first time in recent history. She hailed recent U.S. military sales to Taiwan, saying that the U.S. is “responding positively to our requests.” U.S. arms sales to Taiwan have been an ongoing source of friction in the U.S.-China relationship. “The regularization of arms sales is going in the right direction. So that the process is less politicized and more responsive to our defense needs,” Tsai said. “We are pleased to have submitted new requests for M1 tanks and F-16V fighter jets, which would greatly enhance our air and land capabilities, strengthen military morale, and show to the world the U.S. commitment to Taiwan’s defense,” she said. “Altogether, I hope that these actions will ensure that the people of Taiwan remain able to choose our future free of coercion,” she said. Sen. Cory Gardner (R-CO), who also spoke alongside Tsai, delivered a message of bipartisan support for Taiwan in Congress. “There are very few areas where you look across the globe where you can say Republicans and Democrats can act consistently on the same page in the same direction with the strength and support we have acted with Taiwan and will continue to act with Taiwan,” he said. Gardner told Breitbart News after the event that President Trump and his administration have been “extremely supportive” of Congress’s efforts on Taiwan, and is asking world organizations to include Taiwan in international conferences, symposiums, and bodies. “This is to show that we stand with our allies and our partners, and we want to let people know that we stand committed to the agreements that we’ve had,” he said. Yoho also warned that if the U.S. did not maintain support for Taiwan, it would become more difficult to do so in the face of growing Chinese pressure.